When you have a craving for macaroni and cheese, the big question that comes up for most people today is: mac and cheese from a box, or homemade mac and cheese? Besides being far, far cheaper, boxed mac and cheese is simple to prepare…and if you're not careful, a homemade mac and cheese can turn out with a cheese sauce that's far too thick and goopy. While this stuff tastes good, it doesn't look very appealing. But when you take the time to prepare a good cheese sauce, then stovetop mac and cheese is far better than any of the stuff sold for 50 cents a box in the supermarket. The golden rule for a roux is equal parts oil and flour, and that's why we're using 4 tablespoons of butter and 1/4 cup of flour. Meanwhile, the rule for adding milk to a cheese roux is supposedly "eight times the amount of the roux." Since this recipe uses a roux that's about 1/4 cup in volume (1/4 cup butter plus 1/4 cup flour), eight times the amount for milk would equal two cups of milk. If we were using half a cup of flour and a full stick (1/2 cup) of butter, we would need to double this to four cups of milk. Pans needed: Stock pot or dutch oven for boiling the macaroni. A 10-inch cast iron skillet for preparing the cheese sauce. A whisk is essential for keeping the roux and the cheese sauce from becoming too thick. Use equal amounts of pasta and cheese – if you're making a pound of pasta, use a pound of cheese. The formula for the amount of the milk is eight times the volume of the roux. The roux is 1/4 cup in volume (1/4 cup butter plus 1/4 cup flour), and 1/4 * 8 = 2 cups of milk, with a little extra milk added as well. If you're using whole cheese, cut it into cubes about an inch in size. Shredded cheese will also work fine. Shredded cheese does contain additives to keep the cheese from clumping, and some sites claim shredded cheese contains "chemicals" or other nonsense, but there's nothing hazardous in shredded cheese. Whole cheese is usually better quality than shredded, and this in itself is a good reason to use whole cheese. Prepare macaroni in a stock pot. 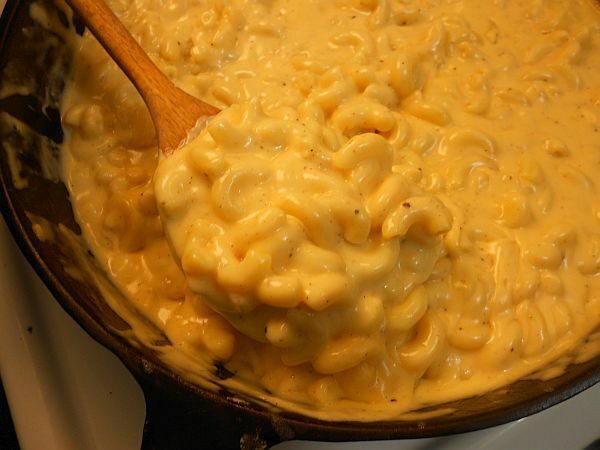 Drain the macaroni into a colander, and leave it in the colander to rest while the cheese sauce is prepared. Melt the butter in a cast iron skillet over low-to-medium heat, in order to prevent the butter from burning. Whisk the flour into the butter to make a roux. Add 2 1/4 cups whole milk to the roux, and stir into a creamy sauce. Be sure to constantly and briskly stir the sauce with a whisk. It's important to use a whisk for preparing the roux, because that helps to wipe out any lumps that form with the sauce. Once the milk is steaming and hot enough to melt the cheese, add the cheese, and stir it constantly to ensure it melts and turns into a good, creamy cheese sauce. Add salt, pepper, a little ground mustard, and some smoked paprika for flavor. Then, it's time to add the cooked macaroni. Stir it into the cheese sauce, and we have a mac and cheese that any kid will enjoy..even kids who've only eaten mac and cheese from a box their whole lives.